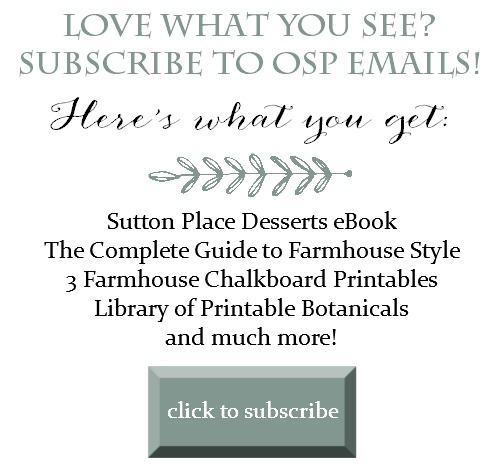 Simple Arrangements Using Garden Flowers & Herbs | Includes list of herbs that pair nicely with garden flowers. Lots of tips and ideas! 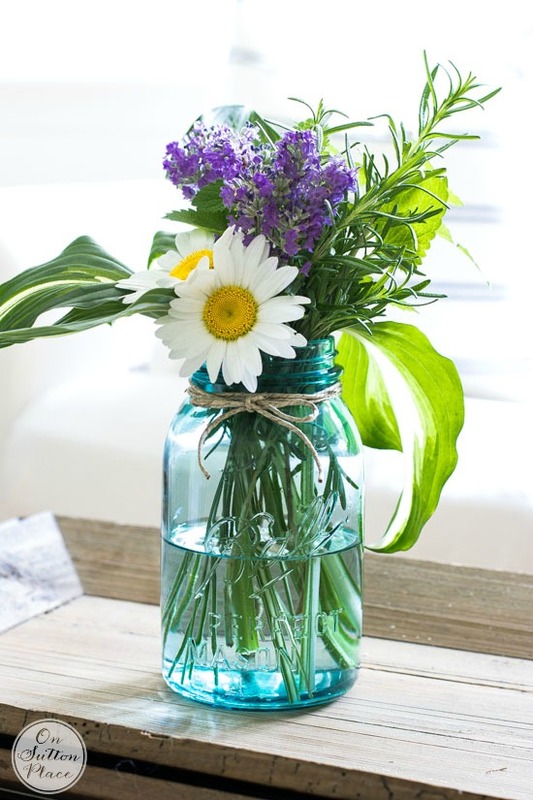 Making simple arrangements using garden flowers & herbs is not only extremely gratifying, it’s a great way to use herbs that might otherwise be wasted. Sometimes herbs grow very fast and, at least for me, it’s hard to use them quickly enough. I’ve never dried or frozen my herbs but I would like to figure that out at some point. I usually just harvest them and scatter little herb & flower arrangements around the house. When summer is over, I’ll plant an Indoor Herb Garden so I have fresh herbs right in my kitchen. When I had everything cut, I started moving the cuttings around until I had five simple arrangements using garden flowers and herbs. Side note about the rosemary: it’s really important to NOT have any leaves left on the part of the stem that is under water. Just strip the rosemary at about the halfway point so only the woody branch is in the water. You can use the stripped needles in your cooking or in potpourri. I brought my arrangements in and used three, gathered on a silver tray, in my entry. The other two I put on my kitchen island. So I cut some lavender and made another arrangement which has actually turned out to be my favorite. Adding natural elements to your living spaces is a great way to bring the outdoors in. 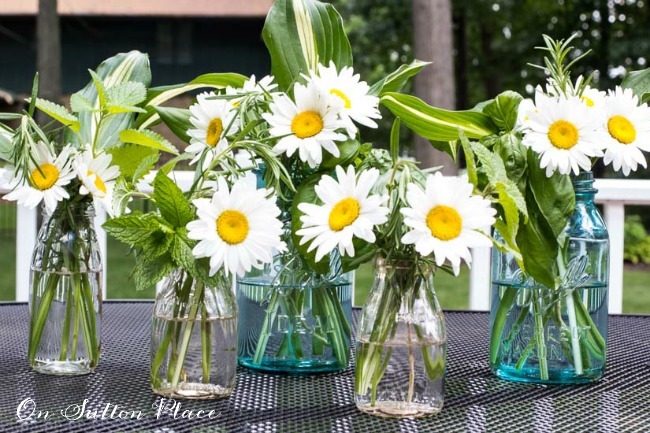 There is nothing better, in my opinion, than walking out your back door, armed with a pitcher of water and a pair of scissors…and walking back in with enough cuttings for some simple arrangements. 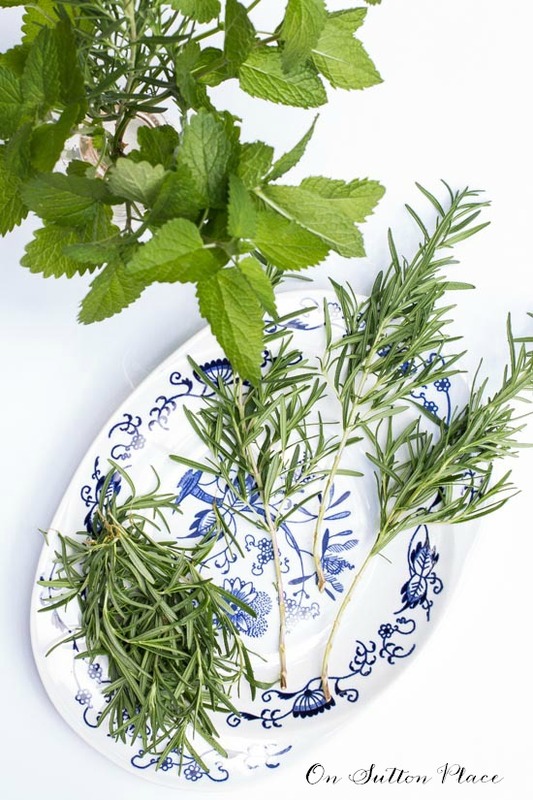 Click for 10 Ways to Use Rosemary! Wishing everyone a very fun and safe 4th of July weekend…see you soon! I never thought of using my herbs in arrangements, these are lovely. I have these daisies coming up literally everywhere. Thanks for the tips! Oh also, I have had -0- luck with lavender. Loved the simplicity! My overgrown herb bed will be getting a trim! Thank you! These are so beautiful, Ann! Hope you’re having a wonderful week! Beautiful arrangements! Thanks so much for sharing with us at Merry Monday. I adore these types of projects and floral arrangements. They make such a gentle statement on living simple and graciously. These arrangements are gorgeous! 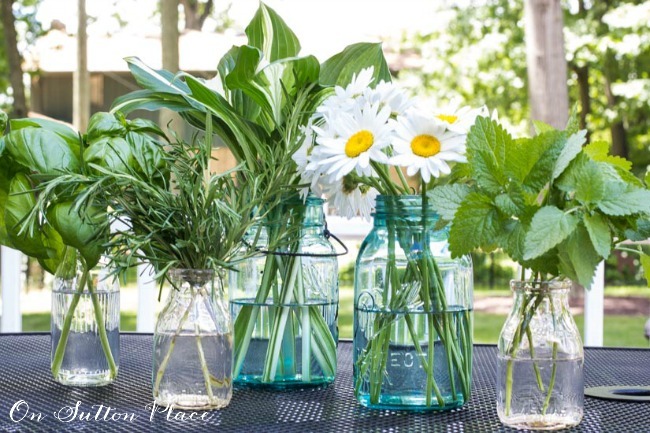 I love using my garden herbs for arrangments> Thanks for sharing at Merry Monday! I love your use of the flowers and herbs, so pretty Ann. Thanks for joining Sundays at Home!! Love the pop of purple using fragrant lavender! Pinning this pretty arrangement! These are lovely and simple…the best kind. Happy Thoughts of Home. Pinning. Daisies are one of my favorite flowers. 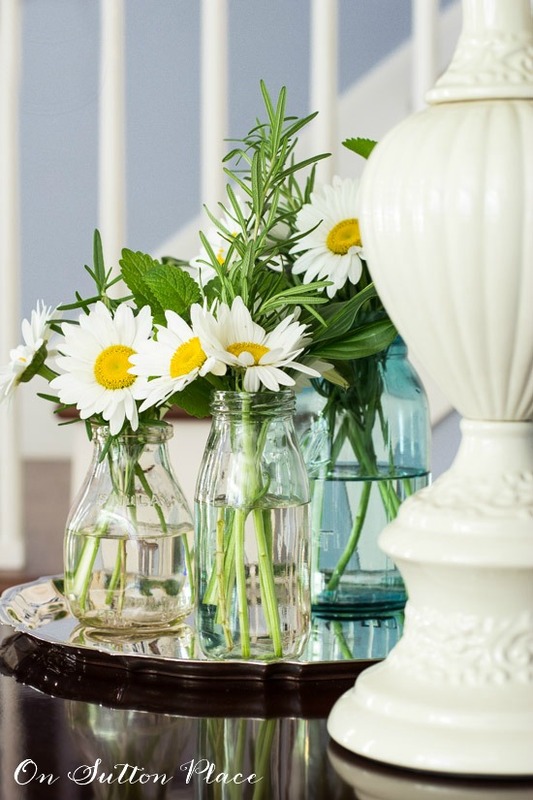 I love the the idea to use little glass containers and put several on a tray. So pretty and welcoming in an entry way. Happy July 4th to you and your family. I ALWAYS enjoy your posts and look forward to the next one. Your links are always interesting, too. Thanks for what you do. Love that everything you used is outside in my garden and/or yard! 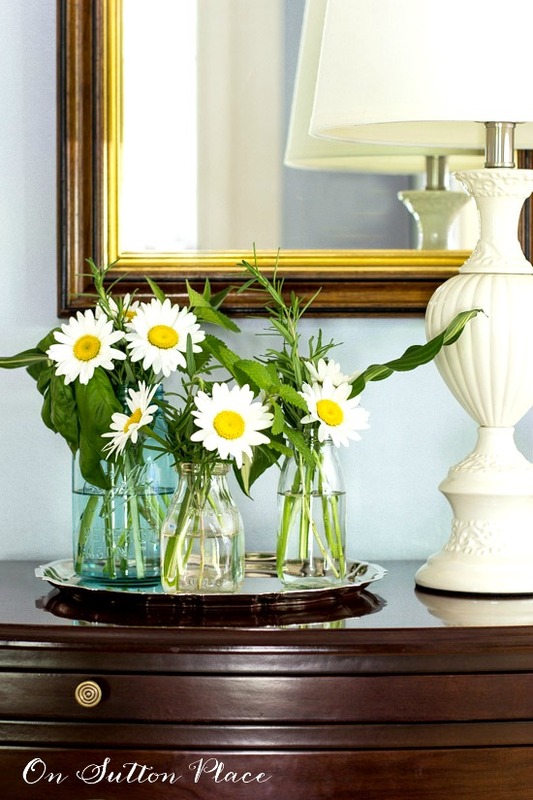 Thanks for sharing another great but simple and easy decorating idea! 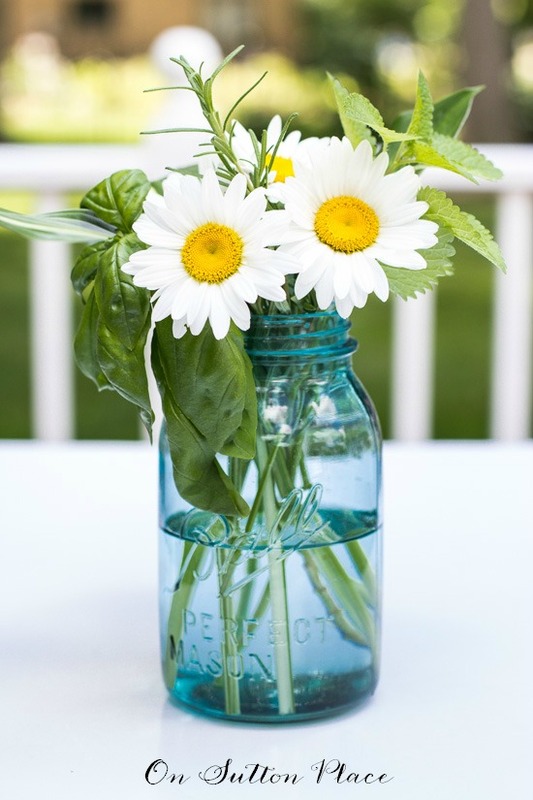 Love the simplicity and whimsy of these sweet little bouquets, especially in the blue canning jars. And did I miss a post? I really like your new format. Since you have answered so many of my questions, and your icebox cakes are my favorite, I will give you a hint about lavender. Lavender comes from the Mediterranean. Most of the US gets much more rain in a year than the area of lavender. HA! HA! It should be planted in full sun (South), WELL drained soil (add sand and mound the dirt) and NEVER WATER. 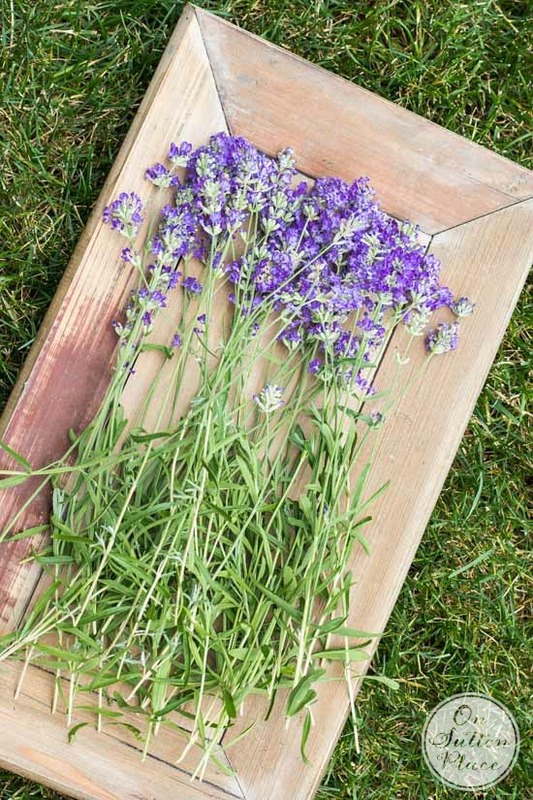 Plan placement of lavender and prepare soil before planting. Don’t even plant near other plants that need to be watered. Waiting for your next posting! So beautiful and I can almost smell them! Love it Ann! Thanks for the ideas! I am having family over today and I am going to make some arrangements and put them on a silver tray too! P.S. I am also making your strawberry shortcake for the 4th of July. It has become a favorite recipe! I bet it smells wonderful at your house! I love the sweet simple arrangements. Happy 4th weekend! The arrangements looks so fresh and summerlike. I wish I could keep herbs alive like you do. I love how you created the vignettes around the house. I just did the same thing for a party in my yard. I used some daisies, some queen Annes lace and some weeds that had teeny tiny berries on it. I got several compliments and it’s fun to decorate without spending a cent!